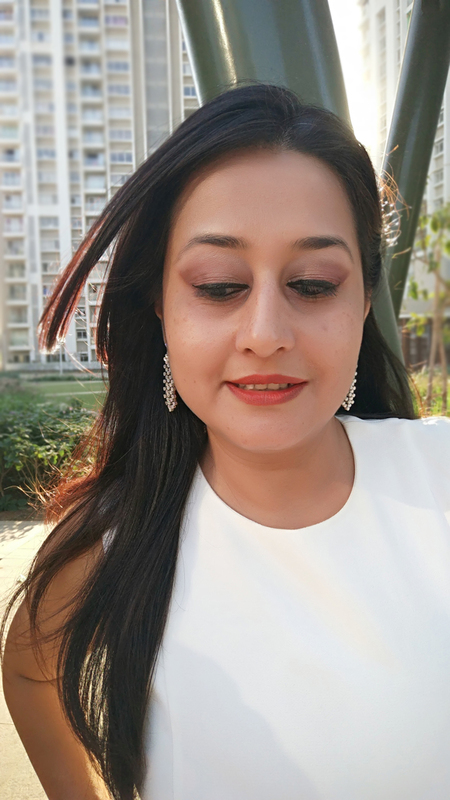 The recent launch of Oriflame Giordani Gold range of products like foundation, lipsticks and more had everyone abuzz with its fabulous line up. 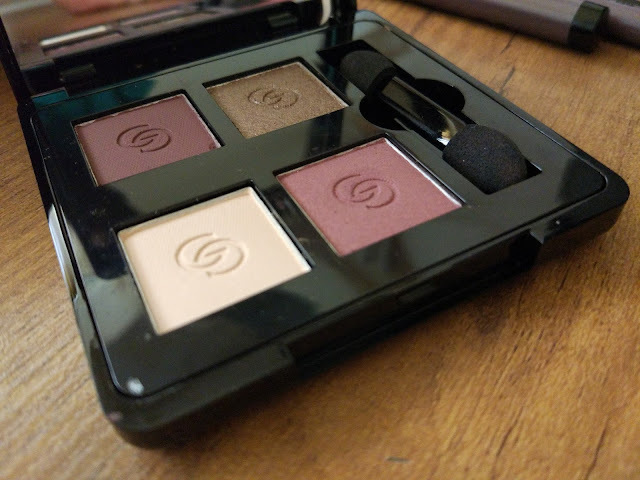 We especially loved the eye shadow quads available in three variants Smokey Grey, Divine Brown & Radiant Plum priced at Rs. 1199/- per quad. Each quad comes with a good combination of matte & shimmer colors that allows you to create a day/night look with panache. The colors are creamy in texture with minimal fall outs during application. The highly pigmented colors stay long as you work hard & play harder & provide with a luxuriously high color pay-off. 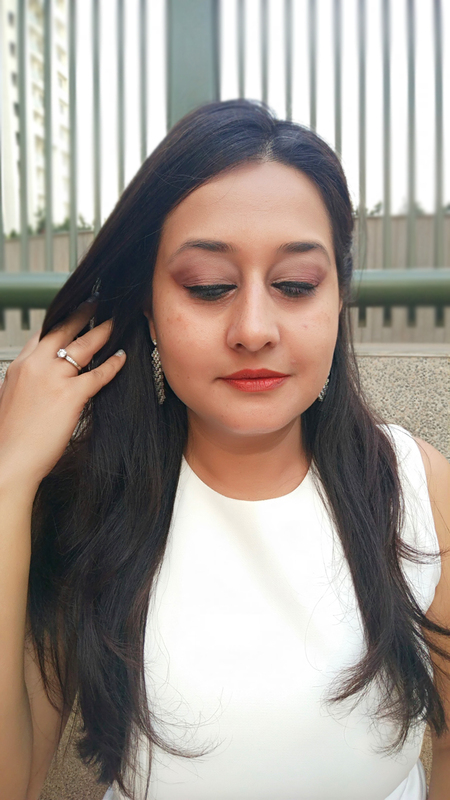 We love the Oriflame Giordani Gold Eye shadow Quad in Radiant Plum & decided to create a look. The colors are suitable for sensitive eyes, making them more fun. It's easy to blend the eye shadow due to its silky texture that adheres to skin providing crease-resistant application & imparts a lovely satin finish to your peppers. The shelf life of each quad is approx 3 years from date of manufacture. The packaging: The eye shadow quad comes in a black, glossy, sturdy & compact royal black case that is easy to carry. The inside mirror helps you for a quick on-the-go application. There is a dual ended sponge applicator but we prefer applying our eye shadows with a brush. 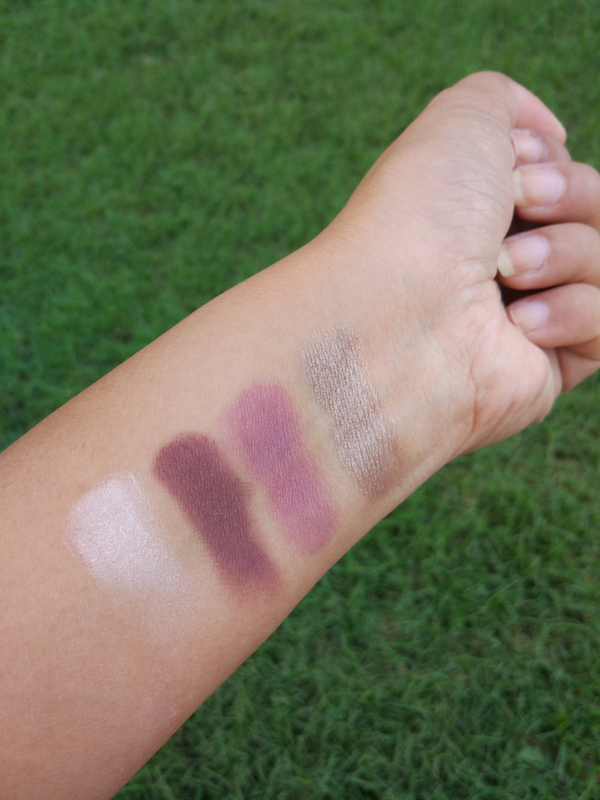 Swatches of the four shades in the Radiant Plum eye shadow quad. All colors are highly pigmented except the third shade that requires a little more application to stand out. Start by applying a eye shadow primer evenly over your eyes. 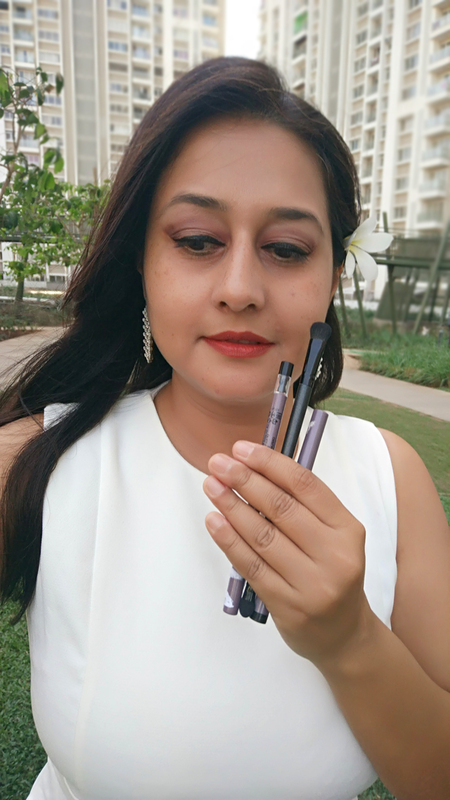 Apply the lightest shade (the first swatch on my hand) on the upper lids of your eyes with Oriflame Professional double-ended eye shadow brush (INR 229). Next, apply the darkest purplish-plum shade (the second swatch on my hand) in the outer corner of you eyes. Blend well till the crease line to create smokey effect. You can also apply a tinge of the same color in the inner corners of your eyes & lower lash line. If you wish you can blend the lighter plum shade along side the darker shade (third swatch on my hand) to create a bit of more effect or skip this step. Fill out the center of your eye lids with the shimmery champagne color. Blend well. Highlight the brow bone with the lightest shade to accentuate the eyes. 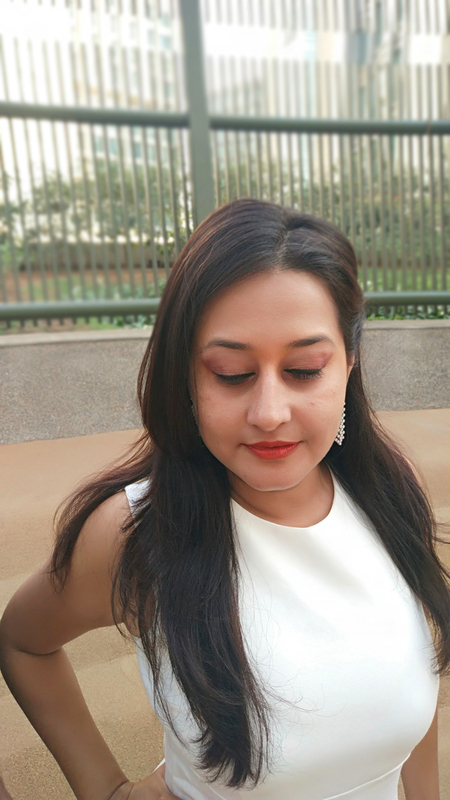 Apply a touch of Oriflame "The One Gel Eye Liner Pencil" (INR 499) & touch of Oriflame "The One Eyeliner Stylo" (INR 499) to complete the look. I made a claim to Un beatable Insurance Agency after we discovered water leaking from our upstairs bathroom down to our garage. After making a claim, our adjuster house insurance miami had arranged for a company to stop the leak and start the repairs, and they were there within a few hours! House insurance Miami helped make a stressful experience much easier. I am very happy with outcome. The benistar company has gained the trust from benefits professionals and Medicare beneficiaries as their retiree benefits service provider of choice by offering much more than just administrative or advisory services. Benefit plan cost containment, reductions and financial recapture strategies…. 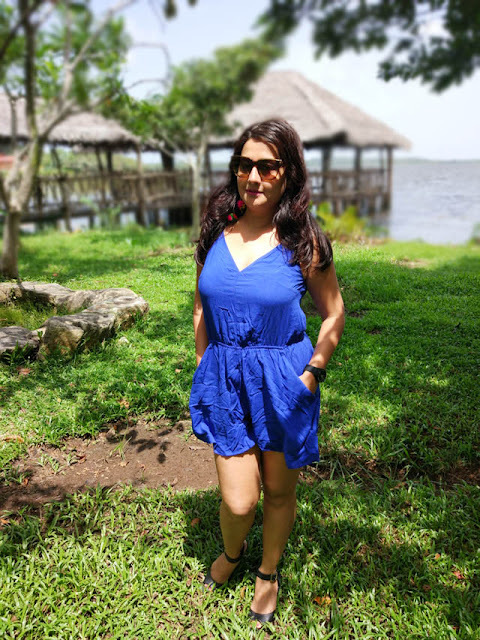 Great thanks for this amazing post! 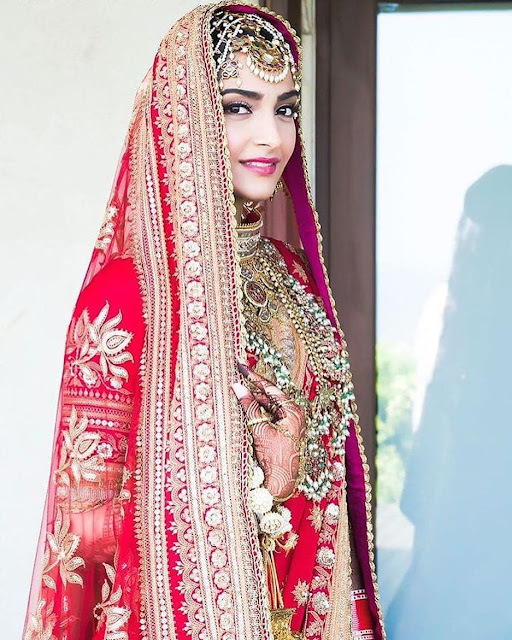 Sooo beautiful you looking in this. She offers expert advice on Perth Lip Fillers, cosmeceuticals products, Hydra Facial, and collagen induction therapy. Pamela understands the dynamics of a smile and with this complemented with dermal health makes her skilled practitioner.